You can have a sliver of health, but it’s landing that final blow that matters most. In the winner’s side of phase 2 pools for Dragon Ball FighterZ at Combo Breaker 2018, Dawn “Yohosie” Hosie was tied 1-1 in rounds against SQ. Her signature Gotenks had done some real damage to SQ’s lineup, with the spinning top attacks consistently shattering their defense. But SQ had caught and knocked out Hosie’s star player, and in the deciding round, Hosie was in a 1-on-2 with only a smidgen of health on her Kid Buu. Unlike her flashy Gotenks combos, Hosie’s Kid Buu play here wasn’t over-the-top or tech-laden. It was smart, calm play that won out, looking for opportunities while not overreaching for anything. 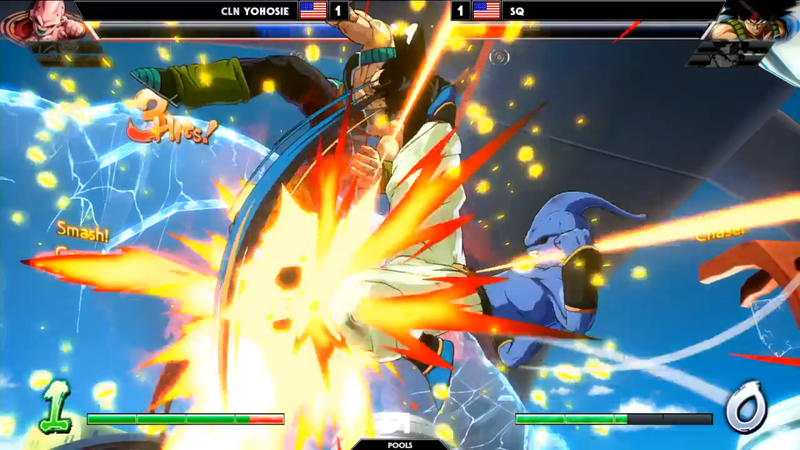 Hosie took down both SQ’s Adult Gohan and Bardock, and advanced 2-1. She would take her first loss of the day in her next match against Ryota “Kazunoko” Inoue, and dropped out of the tournament this morning against Tachikawa, a fellow Gotenks player who had a strong showing at last week’s Stunfest.